Gladiator - interesting slot for real game! The Gladiator slot is a captivating game based on the Oscar-winning blockbuster movie of the same name that came to the big screen in the year 2000. 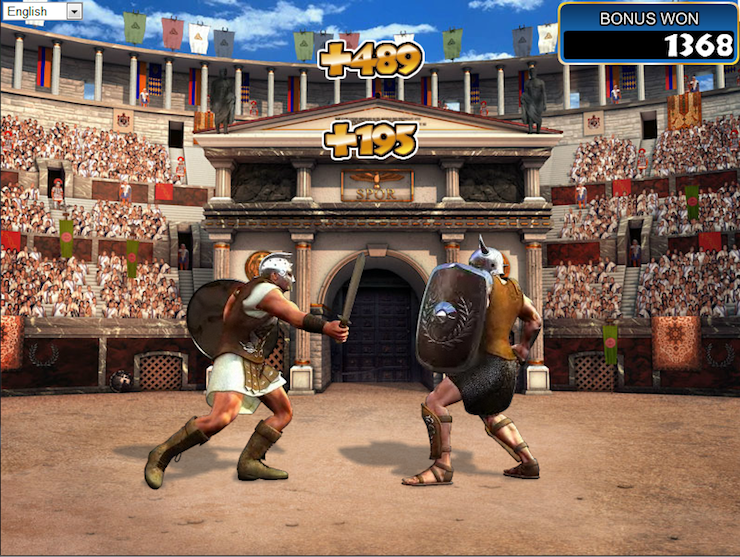 Created by Playtech, the game takes you to Ancient Rome where you can meet the well-known characters. The game features 5 reels, 25 paylines, and 2 bonus rounds. Real money players can win the prizes associated with the game. Helmet is the wild symbol. Three helmet symbols on reels 2, 3 and 4 initiate a bonus game – you`ll get 9 helmets, their value depending on the stuff they are made of (gold, silver or bronze). Three or more Coliseum icons (the scatter symbol) start another bonus game - to get your prizes, you`ll pick a stone from each of the four rows. The Gladiator slot machine game is available both as a free trial version as well as for real money. Combining video sequences from Ridley Scott's film with a great soundtrack, Gladiator will take your breath away! You can play Gladiator at our site for real money, as well as for fun!